Pictured is Basin Lucy 804N, Dam. Basin Lucy 0T20 was selected in the historic Basin Angus dispersion to add another productive and proven cow family to our breeding program. 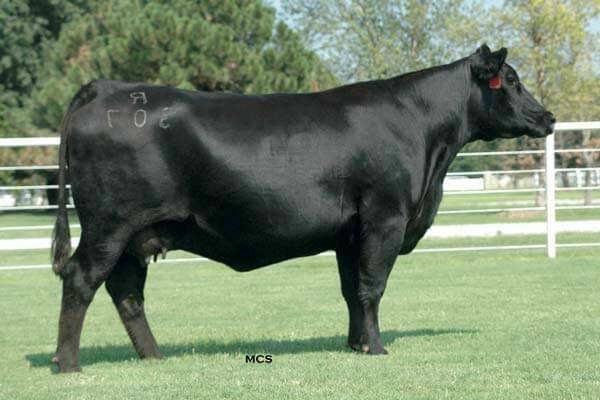 She is a daughter of 263C and out of the $360,000 valued Basin Lucy 804N who served as a donor for Express, Basin, and Southern Cattle Company. She is a powerful female that is exceptionally feminine and has a perfect udder. Her strengths are calving ease, feed efficiency, and carcass quality. She has been exceptionally productive in ET and has impressive progeny by Pioneer, Confidence, Complete, and Capitalist. Half interest in her natural calf by Complete was selected by Rick Nemeth. Watch for progeny by Pioneer, 10X, SAV Harvestor, VAR Generation, and other proven sires in 2014 and beyond. Owned with Thorenfeldt land & Cattle Co.